Tweet Tweet dives into the past | Something Odd! 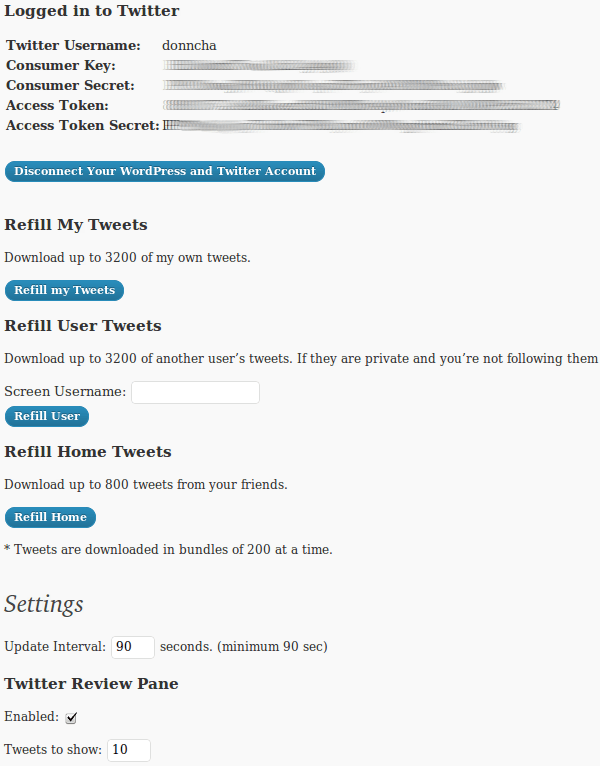 I overhauled my Tweet Tweet plugin for WordPress yesterday so it would work with the new Twitter OAuth mechanism. This morning I made it possible to download your older tweets, up to the max limit of 3,200 tweets that Twitter allows. It’s still a work in progress but I want to get a new release out as soon as I can for current users who are using the basic auth that doesn’t work any more. If you’re feeling adventurous give the development version on the download page a go and tell me what you think! 99% of the OAuth code was ripped from Alex King’s Twitter Tools which in turn uses Abraham Williams’ twitteroauth.php library and OAuth.php from oauth.net. Thank you all for doing the heavy lifting required! No tweets archived yet. Make sure your theme has the “wp_footer” action. must be in the footer.php or in some other theme file. This appears as a floating panel near the top of the admin area. Not sure if that’s how it’s supposed to look or not. Did you see Twitter OAuth login screen when you first checked the admin page? If not you probably downloaded the current release, not the development version. Can you install it again and check again? Will your plug-in work with php4, or will it also requite php5 like Twitter Tools? WordPress is abandoning PHP 4 in 2011. If you’re still using it, I strongly advise an upgrade. We have a very complicated php4 based custom built cms system on the same site/server. It is in the process of being replaced, but with the size, complexity, cost etc I doubt it will be replaced any time soon. It would be nice to have a twitter plugin option till that happens, so I thought I would ask. Sweet! One less plugin I need to build for myself now, as I approach 3,200.
true – i’ve gotta ask it if they could have a look into that – thanks!